Lucknow: Amid reports that Samajwadi patriach Mulayam Singh Yadav could be appointed as the president of the Samajwadi Secular Morcha led by Shivpal Singh Yadav, hectic efforts were on for the break-away group of the new outfit. 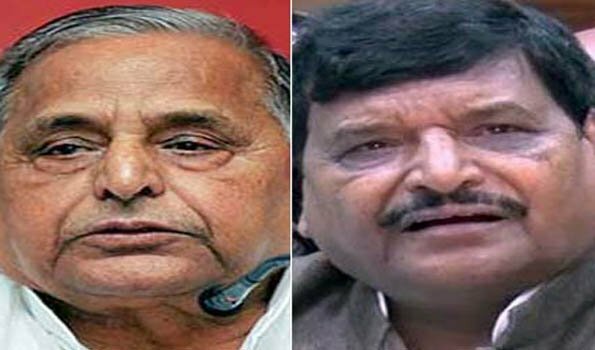 Shivpal Singh Yadav, who was in Etawah on Wednesday, told reporters that Netaji (Mulayam Singh Yadav) is an integral part of the new organisation and it was formed after his nod. Though refusing to divulge whether Mulayam would be given any post in the new front after he was ousted from the SP in January, 2017 by his son Akhilesh Yadav, who took over the reigns after a public spat with his uncle Shivpal Singh Yadav, the front leader said several things are on the cards and it will be revealed in times to come. Claiming that this front would be the most strongest political opposition force in the state and the next government at the Centre will be formed only after their support, he said in 2022 assembly polls in the state, Samajwadi Secular Morcha would stake claim to form the government. Mr Yadav also disclosed that very soon the state committee of the front would be announced while the district level committees would be set up in next one month time. All efforts for a reconciliation between Akhilesh Yadav and his uncle Shivpal Singh Yadav has failed and now both are adamant in running their own political outfits. He added, ''it could be any body's guess as to what Mulayam Singh Yadav had in his mind''. Samajwadi Party patriarch Mulayam Singh Yadav has been observing a guarded silence over his efforts to pacify sulking brother. ''There is no question of reconsideration or looking back. I have taken a decision for forming the Samajwadi secular front and we will work for strengthening the new political formation and we are getting support from all corners of the state,'' said Shivpal Singh Yadav has reiterated. Shivpal Singh Yadav to give a clear message that he has parted company with the Samajwadi party has changed his twitter profile details a couple of days after floating Morcha to replace Samajwadi Party with Samajwadi Secular Morcha. He has also unfollowed SP chief Akhilesh Yadav and Samajwadi Party on Twitter. He even removed the SP flag from his SUV and his residence thus dropping hints at the further widening of the gap between him and the SP leadership. Disgruntled Shivpal claimed that he floated the secular Morcha only after waiting for over a year for his rehabilitation. "I never vied for a post in the party but at least I should have given a responsibility. After all, I have given my sweat and blood to nurture the party to this stature," Shivpal said. Moreover Shivpal Yadav is the SP MLA from Jaswantnagar and has not quit Samajwadi Party. By announcing to float the secular front he has attracted the provisions of the anti defection law which clearly states that this announcement amounts to disqualification from the membership of the assembly.